Thomas Benton McDonald was born at Cumberland, Maryland, in 1907. He graduated from the U.S. Military Academy, West Point, N.Y., on June 13, 1929, on which date he was appointed a second lieutenant, Coast Artillery Corps, Regular Army. He was detailed with the Air Corps on June 13, 1929 and was transferred to the Air Corps on Dec. 11, 1930. Coincident with the establishment of the Department of the Air Force, he was assigned to the U.S. Air Force. He spent the first year of his service as a student at the Air Corps Primary Flying School, Brooks Field, Texas, and at the Air Corps Advanced Flying School, Kelly Field, Texas. In February of 1931, he was ordered to Wheeler Field, Hawaii, and served as armament officer, 26th Attack Squadron and later as operations officer, 19th Pursuit Squadron of the 18th Pursuit group. In March of 1933, he became supply officer of the group and remained as such until June 1934, when he was transferred to Barksdale Field, Shreveport, Louisiana, and assigned to the 77th Pursuit Squadron of the 20th Pursuit Group. He was operations officer and senior flight commander of this pursuit squadron until July 1936, when he was assigned to Wright Field, Dayton, Ohio, as student in the Air Corps Engineering School. Graduating from that school in August 1937, he was assigned to Duncan Field, San Antonio, Texas, where he served as assistant depot engineering officer, chief inspector, and chief test pilot. In October 1940 he was transferred to Olmsted Field, Middletown, Pa., where he served as depot engineering officer, station engineering officer and, later, as chief of the Maintenance Division, Middletown Air Service Command. He remained in this position until July 1943, and during that period served as chairman of a headquarters Air Services command board responsible for planning the facilities at Miami Air Depot, and in May of 1943 was a member of a mission headed by Major General Follet Bradley to the 8th and 12th Air Forces in England and North Africa, respectively. The purpose of this board was to study and determine the personnel and organizational requirements of the 8th Air Force and coordinate the results of these studies with the 12th Air Force. In August 1943, he was transferred to Patterson Field, Dayton, Ohio, where he served as chief of the Maintenance Control Section of Headquarters Air Service Command until March of 1944, when he was ordered overseas. During the period March 1944 to November 16, 1945, he was chief of Maintenance Division of the China-Burma-India Theater Air Service Command (later India-Burma Air Service Command). On the latter dates, he became deputy commanding general, India-Burma Air Forces and, on January 10, 1946, assumed command of the India-Burma Air Forces, remaining as such until inactivation of that organization on April 30, 1946. During these periods, he was responsible for the orderly evacuation of personnel from India and Burma and large numbers from China. Involved also was the final disposition of all Air Force property in the theater, including aircraft. Upon his return from India, he was assigned to the Air Material Command as chief, Maintenance Division. During this period of assignment, he attended the Advanced Management Program of the Harvard Business School. On Oct. 15, 1950, he was transferred to Olmstead Air Force Base as commanding general, Middletown Air Material Area. After having served in this position for one-and-one-half years, he was, in April 1952, transferred to Headquarters U.S. Air Force and assigned as assistant for material program control, Office of Deputy Chief of Staff, Material; and, later, as assistant for logistics operations in the same office. In this position, he directly assisted the deputy chief of staff and material in the direction and control of logistic planning, maintenance, supply and transportation activities of the Air Staff. In June 1956, after over four years duty with the Air Staff, he was ordered overseas, reporting to Headquarters U.S. European Command on June 27, 1956. He was appointed J-4, director of logistics. He is rated a command pilot. Is interested in golf; fond of fishing and boating; likes "do-it-yourself" activity around the house; a hi-fi devotee. Active member of Episcopal Church. Likes Mexican food and seafood, prefers informal dress and relaxed surroundings. Particularly likes symphonic music, especially piano and violin concertos, and has a rather large collection of records; also likes lighter types of music such as Louis Armstrong. Reads current events and technical subjects. Demands integrity. 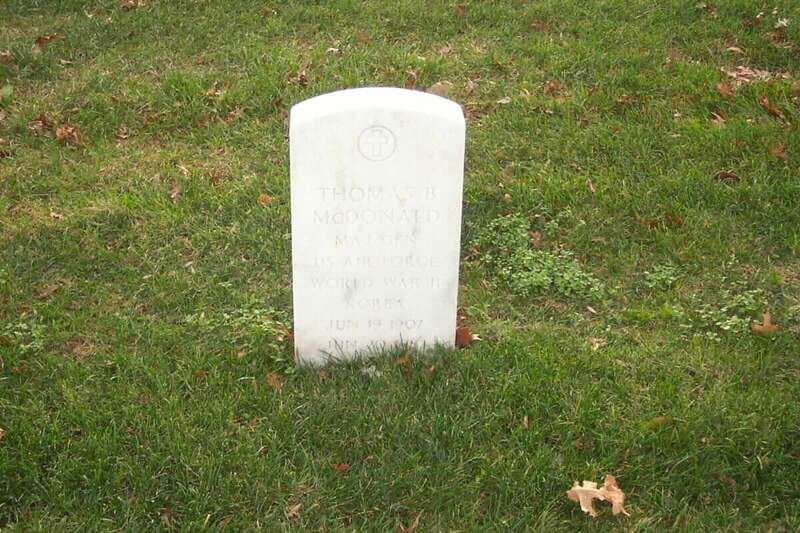 General McDonald was buried with full military honors in Section 6 of Arlington National Cemetery.